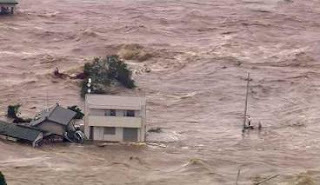 A solitary man, right, waits for rescue surrounded by raging floodwaters in Joso, Ibaraki prefecture, north of Tokyo, yesterday. The scene was captured by Japan's Tokyo Broadcasting System. City officials said 22 people were missing after they had lost contact with them following requests for rescue.